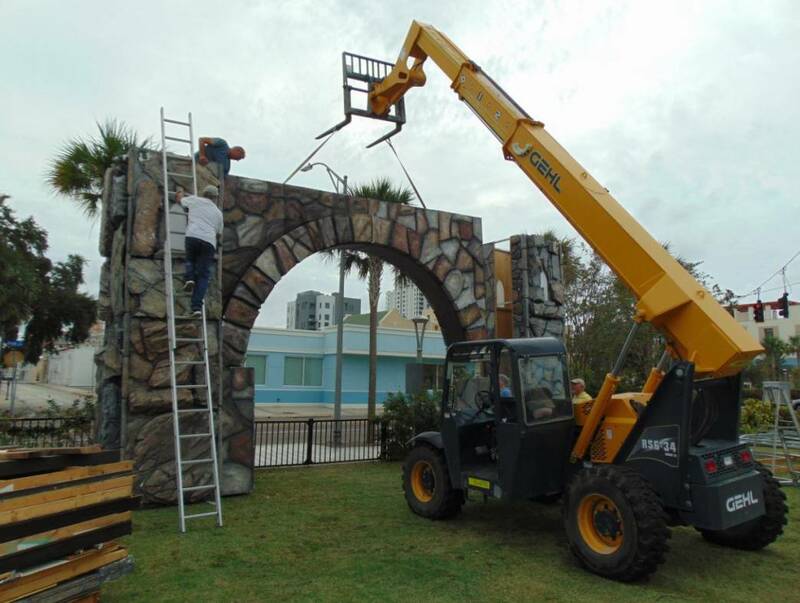 CLEARWATER, Fla. - Nov. 8, 2018 - PRLog -- On the 4th of November the Clearwater Community Volunteers began construction on this year's Winter Wonderland by putting up the prominent gateways to the three week long charity drive for Pinellas County children and moving in the other set pieces that will become the iconic "snow-covered" Christmas village in Osceola Courtyard of Downtown Clearwater. Every person assisting in the massive construction project is a volunteer who uses their experience, heavy equipment and sweat equity to build a village in a matter of weeks. Joel Anderson, Deputy Executive Director for the Clearwater Community Volunteers and construction overseer said, "It takes a lot of knowledge, drive and dedication to make everything happen for the construction of Winter Wonderland. You also have to be able to solve any situation that may come up, from a freak early winter storm to Santa Claus running late due to traffic." "Putting up Winter Wonderland is an intensive project that takes the better part of a month to complete." said Clemence Chevrot, Director for the Clearwater Community Volunteers Center. "Getting the gateway together is just one development in the construction project. Over the next few weeks volunteers will donate their time to ensure that each milestone, such as the arrival of more than 75 Christmas trees, are on time to have Winter Wonderland ready by the first of December." Once opened on December first, Winter Wonderland will be complete with Santa's workshop, Mrs. Claus' porch, a playground, an entertainment stage, petting zoo, giant slide and a food truck serving hot cocoa and snacks. Winter Wonderland is free, but guests are asked to provide donations of non-perishable food items and unwrapped toys for Pinellas County families in need. Donations collected at the petting zoo and other attractions are donated to the Pinellas County Sheriff's Police Athletic League and Nourish to Flourish. The Clearwater Community Volunteers have over 25 years of community service under their belt with over 150,000 families and children helped through various activities since their founding in 1992. Sponsored by the Church of Scientology Flag Service Organization, they stay true to their reputation of helping others with their new center located on the corner of Fort Harrison Avenue and Drew Street in downtown Clearwater.